A 26 year old was in a high speed MVA, sustaining severe chest and pelvic injuries. The patient’s initial observations were BP 75/30, SaO2 91% on 10L NRB, and GCS 10. The patient arrives in your ED, and has bilateral chest drains inserted, which drain both blood and air. Despite 4 units of O -ve blood they remain hypotensive and shocked. You perform a FAST scan to investigate the hypotension but are unable to see anything due to severe subcutaneous emphysema. You perform an urgent TOE. TOE MO long axis view, showing normal LV size and function. RV normal size and normal function. You zoom on the AV and place colour on it….. 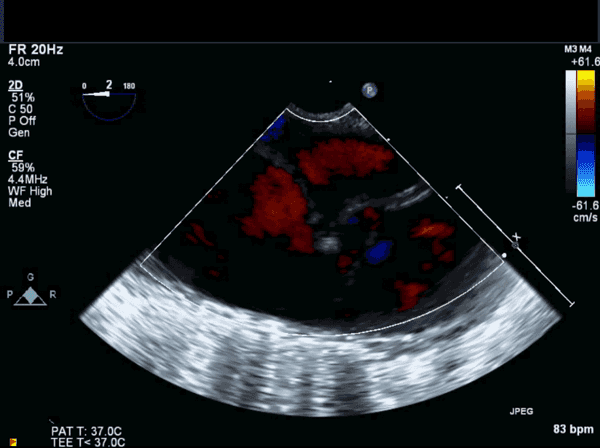 This shows severe aortic regurgitation. Upon closer inspection, two linear flaps were noted just proximal to the aortic valve. These were highly suspicious for an aortic dissection flap. This shows the AV in short axis. The AV is trileaflet, with a dissection flap involving AV structure, and involving the right coronary cusp. You are worried about the distal extension of this flap, so you now assess the aorta. 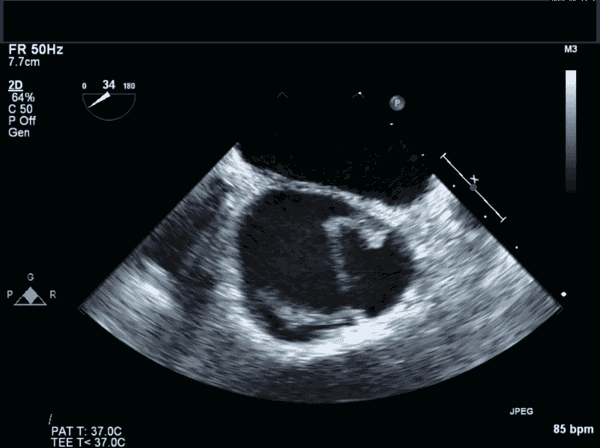 Long axis of the descending aorta showing aortic flap extending down the descending aorta. Note flow in both lumens. 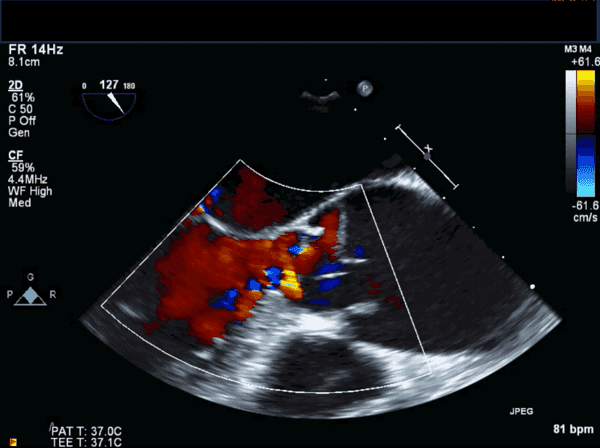 Aortic dissections occur when blood enters the space between the intimal and medial layers of the aortic wall. This creates a true lumen which is perfused, and a false lumen which tends to thrombose over time. Acute traumatic aortic dissection usually begins at the aortic isthmus near the ligament arteriosum, a result of a sudden deceleration in high speed trauma. Non traumatic aortic dissection usually occurs in elderly people with a long history of hypertension. Dissections of the aorta are most commonly classified into Stanford type A or type B. This patient has a Type A, extending from aortic root to abdominal aorta. The degree of flap extension determines the symptoms and complications: proximal extension results in AR, AMI from coronary involvement, and pericardial effusion/tamponade and can present with severe hypotension and shock. Distal involvement causes CVA, arm ischaemia, spinal, renal or gut ischaemia and often presents with refractory hypertension or end organ ischaemia. TOE is useful in the initial work up of a patient with suspected aortic dissection as both the proximal and distal aortic flaps can be seen, as well as the true and false lumens and aortic haematomas. Furthermore, complications can also be diagnosed (AMI-RWMA, tamponade, AR). However CT angiography is very useful (and now more commonly used), and has the advantage of being able to image the whole aorta while allowing imaging of other associated injuries. 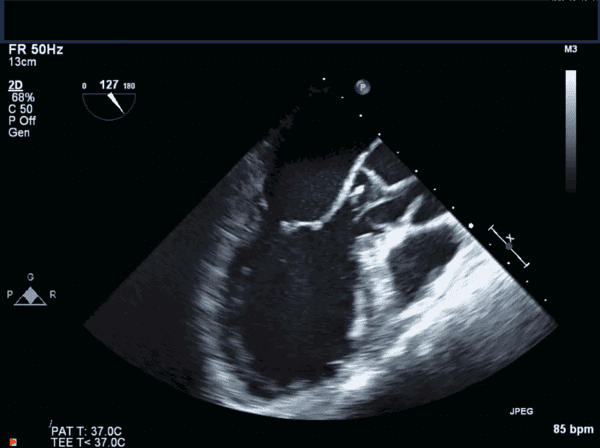 Transthoracic echocardiography is not generally very useful in severe chest trauma as imaging is often poor due to associated pneumothoraces and subcutaneous emphysema. 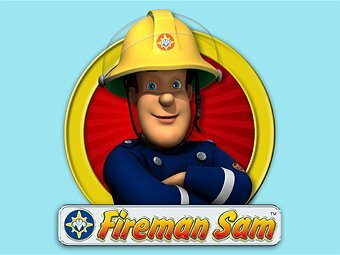 The patient was stabilised, and half an hour later, you are asked to put in a central line and you see this image. What complication is occurring? 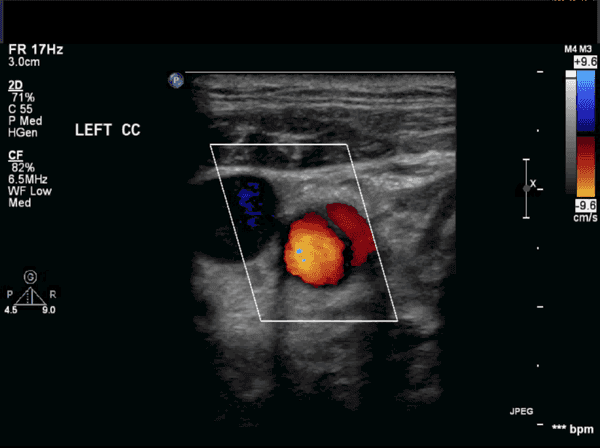 Left common carotid artery (on right of screen) shows two perfused lumens separated by a dissection flap. Involvement of the common carotid arteries can occur with distal extension of type A dissection, and is a concern for CVA. The patient was moved to the operating theatre for urgent open cardiothoracic repair and grafting.